Jordan’s relatively quiet aviation market is due for a long-awaited shake up, beginning on 18-May-2015, as Air Arabia Jordan starts operations from Amman. The arrival of the Air Arabia Group’s latest cross-border joint venture comes as flag carrier Royal Jordanian Airlines has posted improving financial results, having entered into a major restructuring in 2014 to pull itself out of two years of heavy losses. With the Jordanian air travel sector itself still recovering from the fall-out from Arab Spring and ongoing regional instability, the addition of a low-cost player and the rebuilding of the dominant home carrier is set to shake up one of the region’s more stable markets. Air Arabia’s intention to add a hub in the Levant dates back better than five years. Firm plans to add a Jordanian hub were first announced in 2010 after Air Arabia reached a cross-border JV agreement with Tantash Group, an Amman-based company with interests in travel and tourism, real estate, financial services and industrial investment. At the time, Air Arabia had expected to be in a position to launch the Jordanian operation by early to mid 2011. However, the rapid spread of the Arab Spring uprising across sections of North Africa and the Middle East effectively stymied its efforts. While Jordan remained mostly stable, a number of neighbours and potential major markets such as Syria, Libya, Lebanon, Egypt and Iraq faced much more difficult situations. The degeneration of regional security and political ties, combined with spiralling oil prices and difficulty in securing a local air operator’s licence, meant that Air Arabia was force to abandon its Jordanian aspirations. By mid-2011, the carrier announced that it was delaying the launch of the hub indefinitely, as it was “not the right time”. Four years later, Air Arabia is taking its second run at a Jordanian operation, this time with a different local partner and with a much-improved overall situation. In Jan-2015, the carrier revealed it had acquired a 49% stake in local carrier Petra Airlines, and would make Amman International Airport its fifth hub, joining Sharjah, Casablanca, Alexandria and Ras Al Khaimah. The deal means its original Jordanian JV partner Tantash Group quietly excluded. The existing principal shareholder of Petra Airlines, RUM Group, is now acting as Air Arabia’s domestic anchor. At the time of the acquisition, Air Arabia chairman Sheikh Abdullah Bin Mohammad Al Thani said the deal would “enable Air Arabia Jordan to reach its full potential in a shorter time span”. RUM is maintaining a 51% stake, allowing Air Arabia to use Petra Airlines’ AOC and sidestep the prior licensing issue it faced. Air Arabia Jordan will launch operations on 18-May-2015, with service to Kuwait, one of the most heavily travelled routes to/from Amman. Service to Jeddah, another major route, will follow the next day. Erbil and Sharm El Sheikh will be added on 20/21-May-2015. In keeping with Air Arabia’s relatively measured approach to its cross-border hubs, the new Amman base will be home to just two A320s. Air Arabia’s Sharjah base has 36 aircraft, but its Moroccan base only operates four and its Alexandria hub has just three A320s. With another four A320s due to be delivered this year, the carrier can adjust capacity as it sees fit. There is plenty of space for Air Arabia Jordan to grow in the Jordanian market. 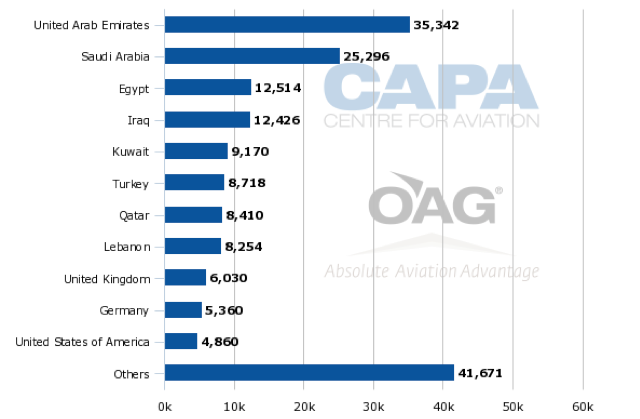 Connections between Amman and other major Middle Eastern and Arab capitals are strong – particularly with the Gulf states - but many smaller regional destinations remain unserved or underserved. Jordan also has ambitious tourism goals, which cannot be met by Royal Jordanian alone. Foreign carriers have continued to add capacity into the market, but the country’s LCC market is comparatively under-developed, at less than 10% of total capacity, and ripe for growth. As a new player enters the market, national carrier Royal Jordanian Airlines is attempting to recover from its tumultuous 2013 and 2014. The carrier is now in the hands of new CEO Haitham Misto, a 33-year veteran of Royal Jordanian veteran who was appointed in Apr-2015 after five months as interim CEO. Under his leadership, it is embarking on another round of cost cutting and network trimming. Accompanying this is a major and much needed long-term financial restructuring, deemed necessary to overcome the cumulative impact of the losses of the last few years. The regional political instability has cut into Royal Jordanian’s traffic, much of it the high-yielding business and tourism traffic from Europe and the Asia Pacific. 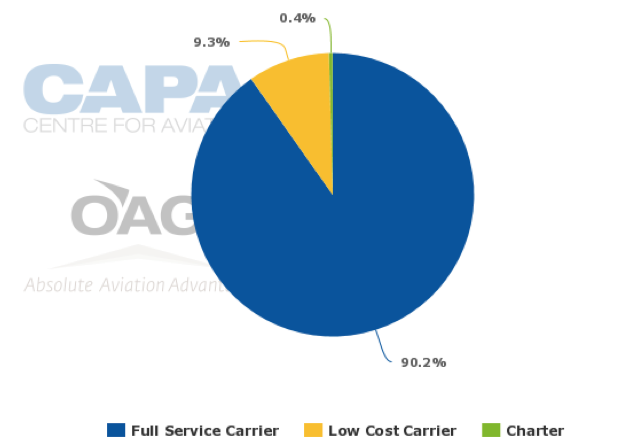 In 2014, the carrier suffered a 1.8% decrease in passengers numbers. This went against the overall traffic trend in Jordan, with passenger numbers up 9% at Amman International Airport. Along with this, the airline has faced continued intensification of competition from the Middle East Big Three – Emirates, Etihad Airways and Qatar Airways. Royal Jordanian also cut capacity during the year, cutting ASKs by 2.1% and reducing flight numbers. With some easing of the regional security situation and fuel prices since mid-2014, the pressure on Royal Jordanian’s finances is starting to be relieved. The carrier cut back losses 64% in 1Q2015, reporting a reduced net loss of JOD8.3 million (USD11.7 million) in the period. The key to the improvement was a 22% reduction in operating costs, which fell to JOD139 million (USD196 million). 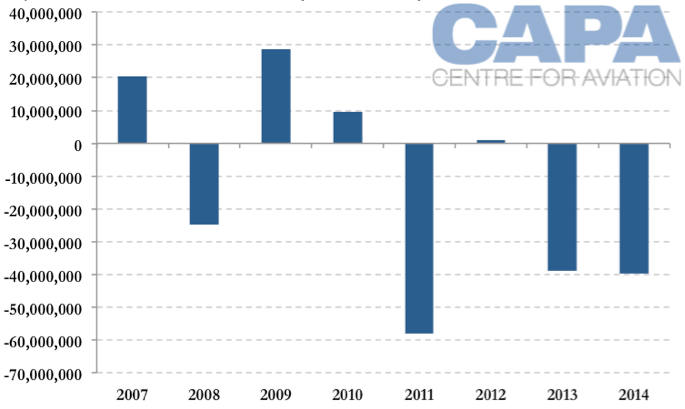 The fall in oil prices – which have stabilised around USD60 per barrel over 1Q0215 – has been the primary contributor. The introduction of more efficient aircraft during 2H2014 and the reduction in flying hours also helped ease the burden of fuel costs. Royal Jordanian has also renegotiated all its agreements with service providers since mid-2014, at the same time as introducing a workforce productivity campaign. 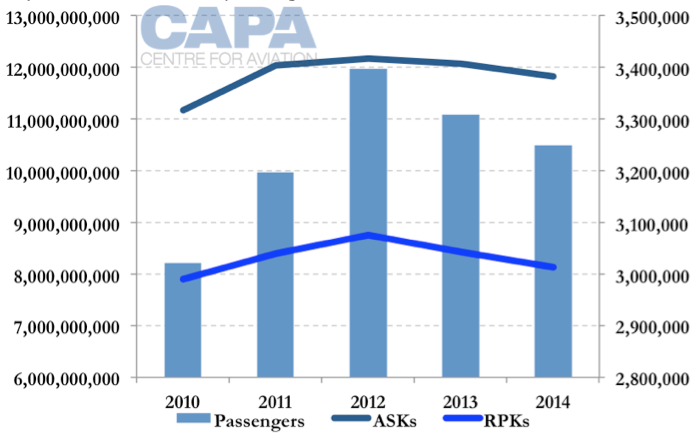 Recognising regional over-capacity was driving down yields, the airline implemented a major network pruning and fleet restructuring latter part of 2014. Under a revised network plan, loss making sectors to Alexandria, Colombo, Alexandria, Milan and Accra were shut down over Apr-2014 and May-2014. These closure were followed by the closure of its Mumbai, Al Ain, Delhi and Lagos sectors in Jul-2014. Sharm el-Sheikh operations were also transferred to Royal Wings, a charter unit occasionally used to test new markets. These come in addition to route suspensions forced on the carrier in Middle East and North Africa in the wake of the Arab Spring. Damascus and Allepo were abandoned in reaction to the Syrian crisis, as were operations to Tripoli, Benghazi, Misrata and Mosul. Flights to Sana’a and Aden have also been suspended since mid-Feb-2015, due to the spread of fighting in the region. Including temporary suspensions, Royal Jordanian has now cut its network back to 50 destinations, compared to a peak of 59 in 2011. Almost as damaging has been the collapse in some key traffic feeder markets, particularly Beirut. The city is a valuable source of traffic to and from Europe. To ameliorate the decline, Royal Jordanian cut back its own frequencies and entered a codeshare agreement with Middle East Airlines. The carrier has also recently signed a codeshare agreement with Oman Air, indicating it may continue to use codeshares to keep its presence up on such routes. In parallel to the network overhaul, Royal Jordanian has been in the midst of a long-haul fleet renewal. The carrier has taken delivery of five Boeing 787s since Aug-2014, leased from AerCap and CIT Aerospace. These aircraft were meant to usher in a new period of growth in long-haul connectivity for the airline, but instead they have been prioritised as vehicles to cut costs through reducing fuel burn and allowing Royal Jordanian to shift out older widebodies. While they have been deployed to Chicago, London, Montreal, Bangkok and other long-haul markets, Royal Jordanian is also using the 787s on local routes to Jeddah, Riaydh, Dubai and Doha. The carrier retired its four leased A340-200s and a single A330 in late 2014. The new Dreamliners are configured with 267 seats - 23 in ‘Crown’ premium class and 244 in economy. This is 13 more than the A340s, which had 24 premium and 230 economy seats, but 16 less than its A330s, which seat 24 in premium and 259 in economy. Visitor numbers to Jordan have fallen from 8.2 million visitors in 2010 to 5.3 million in 2014. 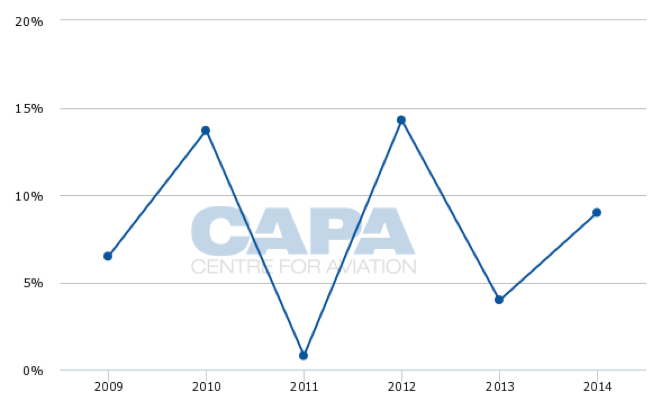 Of these, about 2.8 million travelled by air, a fall of almost 40% since 2010. According to Royal Jordanian, this is due in part to the slowing of economic growth in Europe, as well as a perception in risk-averse Asian travel markets of the Middle East being both homogenous and generally unstable. The carrier has noted that tourism from Middle Easter markets has recovered strongly, and intra-regional travel and business travel is also bounding back. Jordan’s Ministry of Tourism and Antiquities aims to increase tourism receipts by 30% this year, to JOD4.2 billion (USD5.9 billion), as part of wider efforts to get Jordan’s economy moving again. Jordan has a national target increasing travel and tourism’s direct contribution to GDP from 13% to better than 20% by 2024 and Royal Jordanian is seen as a key platform in achieving this. To help drive a recovery in tourist visits, Royal Jordanian announced in Apr-2015 that it is partnering with local tour operators to offer discounted fares, to encourage more tourist visitors from destinations covered by the airline in the GCC and Europe. The Jordan Tourism Board is also actively promoting local tourism destinations in major European centres, including Berlin, Moscow, Dubai, London and Spain. Tourism promotion in emerging markets in South Asia, Southeast Asia and Africa is also being considered. The Jordanian government is also doing its part to encourage a recovery in tourism – it has announced plans to removal the JOD40 (USD57) visa fee for certain travellers, as the first in a series of initiatives to make travelling to Jordan “more convenient and affordable for people of all nationalities.” Other proposals include the waiving of the departure tax for all scheduled flights from Aqaba and Amman, and exemptions to tourist attraction entry fees for visitors who stay more than three nights in Jordan. Royal Jordanian’s financial problems have slashed the value of its shareholders equity. 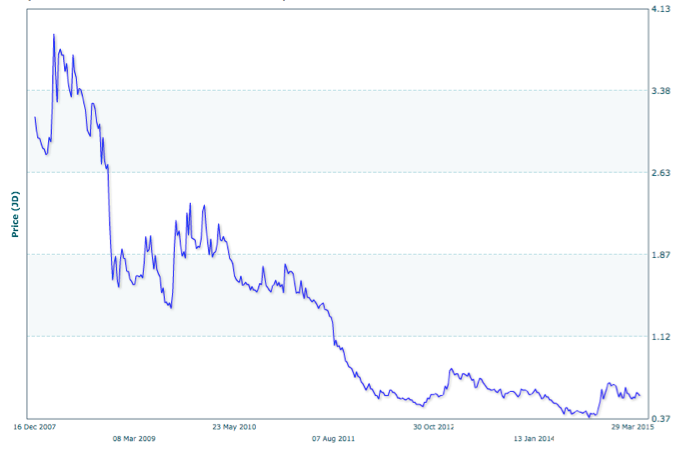 Share prices have stayed in the doldrums since 2011, rarely getting above JOD0.70 per share, a far cry from their Mar-2008 peak of JOD4.09. To help turn around this situation and resolve debt issues, Royal Jordanian shareholders voted to approve a JOD200 million (USD282 million) 2015-2019 capital restructuring plan at the start of May-2015. The restructuring will be achieved over multiple phases, allowing the carrier to finance its restructuring out to 2020. The first phase involves a major capital write-down, almost halving Royal Jordanian’s capital from JOD84.3 million (USD119 million) to JOD46.4 million (USD65.5 million). The move is aimed at writing off part of the JOD39.6 million (USD56 million) in financial losses incurred in 2014. The carrier plans to complete the capital reduction during 2015. This will be followed by three separate capital increases. Implementation of the first, of JOD100 million (USD141 million), will start in 2015. The remaining two increases, encompassing another JOD100 million (USD141 million), will follow out to 2019. The board has not yet decided on the method it will use to execute the capital raising. Three options are under consideration: Seeking a capital injection from the government and or shareholders with 10% or greater ownership; seeking financing from other investors, potentially through a public offering, and; conduction a private offering open to all shareholders. All options remain open and the carrier may decide to go with any, or even all, of these. The Jordanian Government, which remains the largest shareholder with its 26% strategic stake, has already pledged to aid the carrier with the capital restructuring. However, it was reportedly delays in approval for a JOD50 million (USD71 million) state capital injection that resulted in the resignation of Royal Jordanian chairman and CEO Nasser al-Lozi in 2014. Royal Jordanian's other major shareholders are Mint Trading Middle East Limited (19%) and the Jordanian Public Institution for Social Security (10.7%). All three retain seats on the carrier’s nine-member board. With a new carrier entering the market, Royal Jordanian’s financial situation improving and traffic at Amman continuing to grow, Jordan‘s aviation sector in Jordan is in is best position since the onset of the Arab Spring. While problems with regional security persists – particularly in nearby Syria and Iraq – the situation in Jordan is improving. The IMF notes that the regional conflicts are “resulting in disruptions to trade routes, less tourism, a hesitant investment sentiment, high costs to accommodate refugees, and pressures on the quality of public services”, but economic growth in Jordan is “holding up” and the business environment is stable. With just two A320s, the entry of Air Arabia Jordan into the market will have a limited impact, although the presence of a new domestic LCC with a highly visible brand and price-point competition should drive down fares out of proportion to the increase in available capacity and destinations. Air Arabia is making a modest start, but the opportunity is there for significant expansion, linking Africa, the Middle East and Europe. A new domestic competitor will also incentivise Royal Jordanian to continue its own transformation. The national carrier has been in a holding pattern for the last three to four years, although not one of its own devising. An airline turn-around and capital rebuilding is not a simple affair, particularly when government ownership is involved, and it will be another 6 to 12 months before it is clear whether its latest efforts have generated results.